This WSG-1 is Tested and Certified by NSF International against NSF/ANSI Standard 42 for the reduction of chlorine taste and odor. 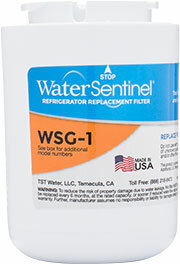 This WSG-1 is Certified by IAPMO R&T against NSF/ANSI 42 for the reduction of Chlorine taste and odor. *GE AND HOTPOINT ARE REGISTERED TRADEMARKS OF GENERAL ELECTRIC COMPANY. KENMORE IS A REGISTERED TRADEMARK OF KCO LP, LLC.